As a young boy, Johnny Taylor was severely traumatised by his evil babysitter in his swimming pool; resulting in him being petrified of water. Years later, as a young adult he is jobless, in debt and living on a cocktail of weed and alcohol so in a last ditch attempt to pay off some of his debt he unwillingly agrees to help his friend with his pool cleaning business. Tempted into the water by attractive females he soon finds his feet and discovers a way of coping with his fear and anger issues by drowning said ladies. His exploits don’t go unnoticed and his trail of victims earns him the title of The Valley Drowner. His new found fame means he is on the run from the police and an increasingly large following of admirers. 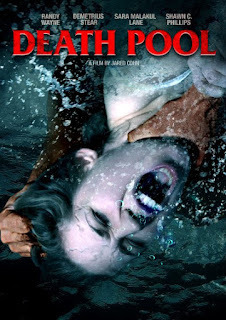 A fun movie from the director of Hold Your Breath (2012) and The Horde (2016), both of which had very mixed reviews and are not to everyone’s taste, but Jared Cohn is going against the haters as he brings another offering in a similar vein. With a mix of genres in the soundtrack and a fair amount of drug and alcohol consumption this does have a lot more than that going for it, the story is based on true events (I believe), and has great flamboyant characters as well as pretty ladies. With that being said though it does have moments of cringe worthy dialogue and does get quite cheesy and predictable but it is to be expected. I can’t hate this movie because there are more things to like about it then dislike so can overlook the awful bits. Starring Randy Wayne (Hold Your Breath,Hellraiser: Judgement) as the incredibly good looking Johnny Taylor, Demetrius Stear (Evil Nanny) as Brandon, Sara Malakul Lane (Kickboxer: Vengeance) as Scarlet and a brief appearance from Writer/Director James Cullen Bressack who all put in an acceptable performance but it is a shame that some of the others involved are pretty rubbish. Blood and gore is pretty much non existent here, though I find the idea of being drowned really quite traumatic in itself so found certain scenes suitably uncomfortable without the need for a lot of effects. At times he doesn’t always need to use a pool either. Wayne’s character provides a certain sick poetic romance to one particular kill as well so I don’t think a large amount of gore is really necessary or warranted in this instance. The way this is filmed, acted and written is not bad at all but in my opinion will only ever score the high end of a 3 star review but I enjoyed it and definitely think its worth a few watches.